Made by Aveling and Porter Ltd in Kent, England, 1922-1923. This steamroller was used for over 30 years to make and repair the roads of Bowral municipality in the New South Wales southern highlands. Steamrollers, more correctly called road rollers, were the last type of steam engine to be used on the roads. Ironically, it was the growing popularity of vehicles powered by internal combustion engines that led to the proliferation of steamrollers to compact roads both before and after tar was applied, creating a smooth road surface. The road roller is similar in appearance to a traction engine but instead of two front wheels it has two wide rolls set closely together. The two rear wheels have broad flat tyres and act as rear rolls. The Aveling and Porter road roller is of standard roller design, with its front rolls well forward under a projecting saddle. It features a side-by-side compound engine with piston valves set on top of a horizontal boiler behind the chimney. The flywheel is of the disc or block type and steering is via a worm gear and chain fixed to the protruding front roll spindle. The rolls are attached via a kingpin that acts as a swivel through a plate bracket on an iron saddle in front of the smoke box door. A canopy protects the driver from the weather. Printed in bright green and yellow on both sides of the engine is, 'MUNICIPALITY / OF / BOWRAL'. On the rear left centre of the wheel is, 'AVELING & PORTER LTD ROCHESTER' and a plaque printed in gold on a red background reads, 'RESILIENT SCARIFIER / C & FS PRICE'S PATENTS 118487 119406 18 / SOLE MANUFACTURERS / AVERLING & PORTER LTD / ROCHESTER / No 224'. Another oval plaque on the right hand side reads, 'BY ROYAL LETTERS PATENT / No 10637 / AVELING & PORTER / LIMITED / ROCHESTER / KENT. ENGLAND'. 'D83' is stamped in red on the back cogs of the engine and 'D149' is stamped on the body covering the front roller. Inside is a guage marked 'PRESSURE' and two plaques. The first reads, 'WORKING PRESSURE TO BE FULLY / MAINTAINED TO RED LINE ON PRESSURE GUAGE' and the second reads, 'CLEAN OUT THE BOILER / AFTER WORKING 100 HOURS'. Below this is also 'WATER LEVEL' stamped in black and on some exterior metal joins is '3468' and 'D782'. The first successful road rollers were developed in France by Lemoine and later Gelleret whose machine was an adaptation of the railway engine. In 1867 the progressive Thomas Aveling of Rochester in Kent, England, supplied a massive 30 ton (30.5 tonne) machine to the Liverpool Corporation. Aveling and Porter continued research and development and tried numerous designs but all were faulty and unwieldy. Then, in 1870, the final form of the roller emerged, a simple portable or horizontal type boiler, with a single or compound engine behind a chimney with chain or geared-drive to the rear wheels, similar to the fast-developing traction engine of the day. Steering was by worm gear and chain attached to the protruding front roll spindle. The roller itself had a kingpin as a swivel through a plate bracket in the front smokebox door. It was this idea that led to the front rollers being placed well ahead of the smokebox by means of a heavy iron saddle. This became the standard pattern for all three-wheeled rollers. Although Aveling and Porter were the first to develop a practical machine, they continued to modify and develop their designs. Equipment that became standard were scrapers and water trickles to clear mud packed up on the rollers. Many rollers were fitted with scarifiers for use where the existing road surface had to be broken up. Some rollers had a steam take-off for use in heating tar. Other makers offered a 'convertible' that had a detachable front roller that could be replaced by a two-wheeled axle to convert the vehicle to a traction engine. The road roller was built by the foremost steam roller manufacturer, Aveling and Porter Ltd, of Rochester, Kent, England. In 1850 Thomas Aveling moved his business from Ruckinge, Kent, to Rochester where he was joined by Richard Thomas Porter in 1862 and became Aveling and Porter. The firm's factory was established on the south bank of the Medway River at Rochester and was incorporated in 1895. Aveling and Porter joined the ill-fated Agricultural and General Engineers Ltd in the 1920s and amalgamated with Barford and Perkins Ltd in 1933 to become Aveling-Barford Ltd, which moved from Rochester to Grantham in Lincolnshire. The company's emblem was a rampant or rearing horse with the word 'Invicta' set in brass on the front of its engines. The horse and scroll form part of the arms of Kent. The rearing horse was a symbol taken from the war banners of the invading chiefs Hengist and Horsa who, in the year AD 449, forced their way across the Thanet coast into Kent. The word 'Invicta' signifies the Men of Kent who were not beaten by William the Conqueror, but rather continued to offer resistance and later made a treaty with him. The Museum's Aveling and Porter road roller is one of about 8,600 rollers made by the company. It left the factory on 14 May 1923 with the builders No. 10637. Rollers of this type were introduced shortly after the First World War and were amongst the first built by the company on standard jigs to give maximum standardisation of parts. The Museum's Aveling and Porter road roller was imported into Australia in 1923, through Noyes Brothers of Sydney for the Bowral Municipal Council at a cost of 1,321 pounds ($2,642). It was used for construction of road surfaces throughout the Municipality until about 1955. The roadroller spent all its working life at Bowral, NSW until 1955. In 1960 it was presented to Bruce Macdonald, manager of the Goulburn Steam Museum, who drove it under its own steam to Goulburn. 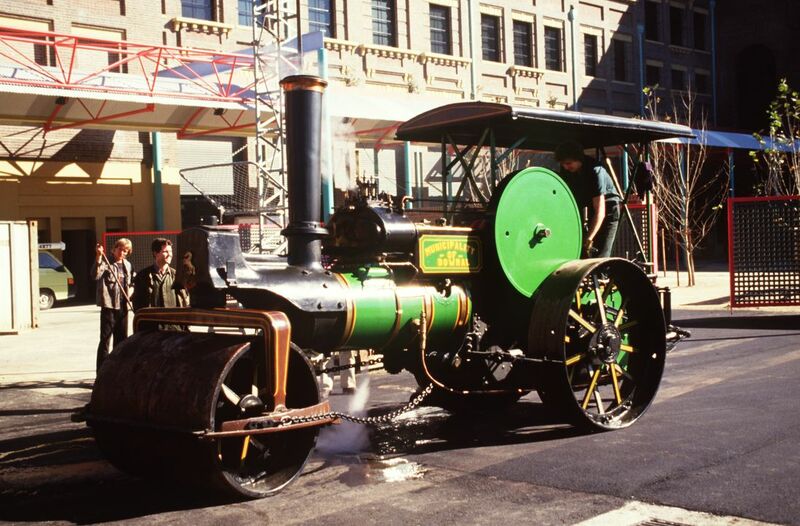 For some years it was on display at the Goulburn museum and was last in steam in 1976, operating at 180 psi (1 241 kPa). The only work undertaken by Macdonald at this time was the replacement of a piston rod. The Powerhouse Museum purchased the road roller from Macdonald in August 1977 and left it on loan to the Goulburn Steam Museum until 1983, when it was transported by low loader to Sydney. During the 1980s the roller was restored to steaming condition for the Museum by contractors.